Call us with your chosen tour date: all dates are available! On our full day Ultimate Grand Canyon Tour, you won't miss anything! 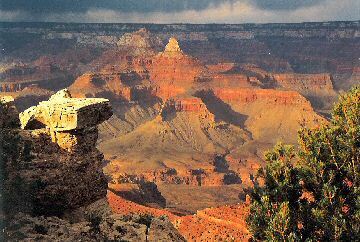 We will visit all the iconic viewpoints along the South Rim. You will have a sit-down geology presentation with take-home surprises. The tour includes lunch at a great restaurant at the edge of the Painted Desert and a visit with Navajo Indians. 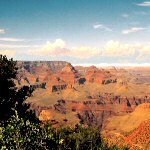 Enjoy our Grand Canyon Day Tours from Williams, Flagstaff, Grand Canyon, or any nearby hotel or campground. We Have Arrived at the Grand Canyon! We will whisk you to the breathtaking South Rim. In a few minutes you will be walking into the pine-forested ledges of our first outdoor vista, Yavapai Point. For many, this is a first view of Grand Canyon, so we allow time to just take it all in. You may use our provided binoculars to pick out distant sights: the Colorado River, Phantom Ranch, the mules on Bright Angel Trail. Here at the South Rim, we acknowledge the depth of the Canyon and the even greater depth of geologic time. The rock layers formed one by one with great pauses (unconformities) between each layer. Then, much later, raindrop by raindrop, grain by grain, and landslide by landslide, the Grand Canyon grew. Now it is 277 miles long and averages 8 miles wide, all in Arizona. We will walk a bit of the level Rim Trail, focusing now on the diverse plant life of the area and any wild animals or birds we may encounter (you will get a colorful hand-out Info-sheet). It is not uncommon to see deer, elk, bighorn sheep, or a California Condor soaring above the abyss with the ubiquitous Common Ravens. The condor has the widest wingspan (9.5 feet) of any bird in North America. Check our Birding Tour page. “Just as thrilled with this experience as with our Sedona Tour with Canyon Dave Tours. Great information, well presented, good pace, everything an A++ experience. Don't change a thing!" -Judi and Arthur E.
Time for lunch already! In a beautiful restaurant you will order from the menu (included in tour price). There are delicious Mexican, Italian, and Navajo dishes as well as American fare. Nearby is a selection of Indian-made items if you are in the mood to shop. Let's Rim-hop to Grandview, Moran, and Lipan Points! Depending on time and traffic, your guide may stop at all of these outstanding viewpoints. You will sit comfortably on folding chairs in view of the Canyon. Your guide will lead a memorable session on Grand Canyon rocks and their ages. You will pass around larger specimens and place smaller ones on your geology handout. Here also, we will piece together the four eras of Grand Canyon's geologic history and note the rock layers left at the end of each chapter. In testimonials, this stop rates as the favorite on the whole tour. We return along the Grand Canyon's South Rim in time for a final splendid viewpoint. By now, the magic of late afternoon shadows transforms the Canyon into a distant Shangri-La. It is also the best time for final photos and the most likely time for wildlife. Book the Ultimate Tour here! Next, Remember to Email Us Your Chosen Date! The price includes restaurant lunch, park entry, snacks, and beverages. Departs daily, starting at your hotel and ending about 5:30 PM. This tour starts from Grand Canyon or any nearby city: Flagstaff, Williams, Valle, or Tusayan. Sedona guests will drive to Flagstaff to begin. Copyright ©2016 Canyon Dave Tours, all rights reserved.